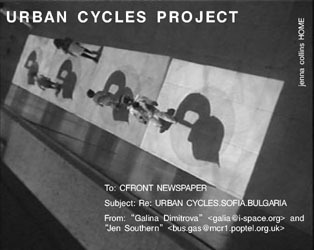 In September 2000 six Manchester artists travelled to Sofia, Bulgaria to work with four Bulgarian artists to install the public interactive video series "Urban Cycles". This exchange project was initiated by the Interspace Media Centre, Sofia and will come to IDEA, Manchester in April 2001. The project has evolved through a yearlong process of online communication and collaboration. The following excerpts are taken from an extended conversation between Jen Southern, one of the artists participating, and Galina Dimitrova, the project's curator. GALIA: From the beginning Interspace had planned to develop the project as an international collaboration. We were interested in the diverse visual and conceptual perspectives of an international group of artists in relation to the specific public space of the Bulgarian National Palace of Culture. The experimental nature of the project and the use of hi-technologies determined a long and sophisticated process of creation and preparation, in which we also wished to collaborate with an organisation and artists who have experience in that area. Interspace had been introduced to Idea's site-specific digital and video projects through our contact with Gary Peploe an artist working with IDEA who made presentations during the "Videoarcheology" International Video Festival, organised by "HO Association for Contemporary Art" and Interspace's Media Arts Festival "Project END". JEN: The practises of all the artists involved are linked by an interest in urban sites and digital installations. In June this year  we made an initial visit to Sofia to meet and to explore the site. The NPC, where the work was to be installed, is vast. Built in 1981 on the wishes of Liudmilla Zhivkova, daughter of the then communist leader, this cultural palace consists of 15 floors, 8 auditoriums and a five-storey foyer with a marble floor onto which our videos would be projected. A park with formal fountains extends several hundred metres in front of it. These large public and open spaces have the concrete optimism of 1970's public galleries and libraries in the UK, but on a much bigger scale. During the installation Monserrat Caballe performed, the huge 4 storey tall modern chandeliers were turned on, and as ticket holders flooded in, the building took on its intended grandeur and status. GALIA: The choice of a public space over a traditional gallery was determined by the wish for a large-scale visual impact and to reach wider audience of both general public and cultural consumers. To put the project into an "official" cultural space, into the public art context and outside of the artist run gallery. The Palace of Culture is a unique space; its architecture and function were very appropriate for this project. The giant building was built to host diverse and prestigious cultural events. Nowadays however many commercial activities take place there. This typifies the current socio-cultural situation in Bulgaria, in which such institutions have no public support and must finance themselves. The monumental architecture typical of the Communist period both framed the large-scale projections and opposed the dynamically changing images, the various levels of the foyer interior allowing multiple perspectives on the projections. GALIA: The project presents the artists with a common platform for creation and exhibition of individual works multiple-screen video installation, integrated within the urban environment. Entering into a well-known public space the visitors are drawn into a changed environment, four juxtaposed video images projected onto the foyer floor created a "visual illusion and spatial manipulation" (*). The everyday flow of people coming into the Palace of Culture are provoked to participate in the work, as they trigger images via a sensor system when walking through them. JEN: The technical set up for an installation is usually seen as the main factor shaping the interaction. In using the same system on 10 consecutive days for ten different works, Urban Cycles revealed that the interaction between artist, audience and site had more to do with content and context than with technical set up. The works became an investigation of the role of the audience in not only a publicly triggered installation, but also in the changing face of a public space. As the audience tried to catch, to anticipate, to avoid these works they became creative participants, official intruders, unwanted guests, members of a faceless crowd, cumulative and creative numbers. The solidity of the architecture was challenged by Dourmana's body laid bare, my own architectural addition of an extra floor, and the moving filmic video of both Myers and Terziev animating the solidity of the monumental. The artists played many roles: the covert intruder, the domestic performer, and the defender of the space. In Krassimir Terziev's work the audience's movements assembled fragmented clips of the film Casablanca, Maria Berova's cleaning lady aggressively cleaned up after visitors, taking care of the building, Anneke Pettican's silhouetted figure wrote graffiti specific to the building onto the floor, leaving sentences half written when visitors approached. Gary Peploe's fruit machine of Eastern and Western icons and logo's invited you to play serious games. In Nikolay Chakarov and Steve Symons' work the audience played a cumulative part. While for Nikki they were faceless ants colonising the space, for Symons each audience member and the cumulative order in which they entered the four trigger areas built up a "language genome" unique to the paths taken through that specific space. These articulations of the role of audience also reflected on the role of the artist in a public space. As Jenna Collins invited the audience to walk into images of her home, their interaction became an intrusion. Petko Dourmana's image lay provocatively naked as if buried under the floor of the palace of culture, turning in pain as visitors walked over him. 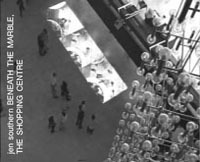 In my own work visitors revealed black and white snap shots of the shopping centre inevitably incorporated beneath the floor of the Palace of Culture, whilst Adele Myers four videos showed traffic flows through cities, as a path walked through the images became a journey through the traffic of international cities. These works negotiated a series of temporary relationships with the audience, with the building, and with each other. These relationships were perhaps specific to that building, or buildings of that kind, but they were also a more specific interjection into both the field of public arts within BG, but also the more general field of video art. GALIA: Following the exhibition of this work it has become obvious through the interest of journalists, artists and critics that Urban Cycles made public media art approachable and attractive to a great number of people. According to the NPC, over the 10 days 20 000 people either consciously or incidentally viewed and participated in the creation and composition of the works. The project provoked mass media interest in public art events. Most journalists reviewed it as sensation and qualified the artists' work as radical acts to current socio-cultural life NPC's commercial activities. Urban Cycles UK will take place in September/October 2001, when the Bulgarian and UK artists and Galia Dimitrova will take up a month long residency at IDEA to make new work for the Manchester site. (*) - This is how David D'Agostino described the project in his review "Urban Cycles brings new media to public space", published in the Sofia Echo English-language weekly newspaper, Sept.29-Oct.5, 2000.